We'd Love to Be Teammates with These Characters! Sports can be serious business — especially when there's a big game or championship on the line. And that makes it really important to have teammates who know how to cut through the tension with a joke, prank, or just something super funny to say. So, we thought for our May 2016 issue — which is all about the funny side of sports — we would choose the funniest athletes playing today. And after consulting interviews, social media, videotape, and athletes themselves, we've come up with a solid list of who we think are the five pros who are best at putting their teammates (and other players) in stitches. The veteran goalie doesn't take himself too seriously either. After a shot from center ice trickled past him, he tweeted a picture of himself using a glove with a giant piece of cardboard attached with the caption, "problem solved." And when a fan tweeted to ask for a birthday shoutout from the "world's greatest goalie," he forwarded the request to Carey Price of the Canadiens. The big man isn't afraid to embrace his silly side. The self-described "cool nerd" is known for the wacky faces he makes during games — often at his kids, who frequently sit courtside. The quirky midfielder is known for keeping the U.S. women's national team in stitches. Some of her funniest moments have come on goal celebrations. At the 2011 World Cup, she celebrated scoring by picking up a field microphone and singing the song "Born in the U.S.A."
Now that Peyton Manning has retired, the new QB comedy king is Rodgers. He's such a good photobomber that there's a website dedicated to it. But he also does highbrow humor. 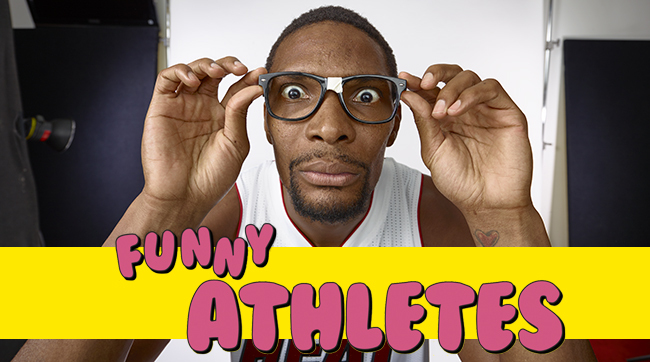 His teammates call his jokes "algebra 2" because not everyone gets them.